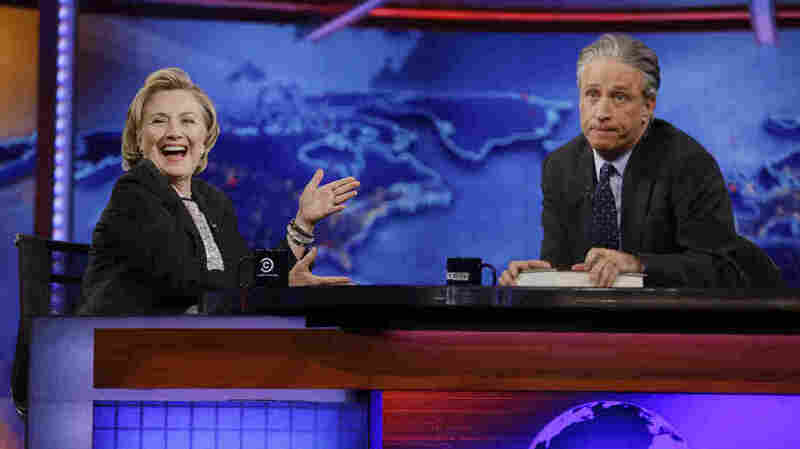 Hillary Clinton reacts to host Jon Stewart on The Daily Show in 2014. According to a new survey, Bernie Sanders' supporters are more likely to watch the show than are Clinton's supporters. People who want Sen. Bernie Sanders to be the Democratic presidential nominee are twice as likely to book travel reservations on Kayak or take that flight on budget carrier Spirit Airlines as former Secretary of State Hillary Clinton supporters. They're also twice as likely to tune in to The Daily Show. Clinton backers, on the other hand, are far more likely to use a Fitbit or other wearable device to track their activity levels. That's according to survey results a major collector of online data recently provided to NPR. When it comes to policy, Clinton supporters are much more inclined to be satisfied with the current corporate tax rate. About 21 percent of Clinton backers say the current rate is appropriate, while only 1 percent of Sanders backers feel that way. About 33 percent of people who prefer Vice President Biden, should he enter the race, as the Democratic nominee are fine with the current corporate tax rate. These are just a handful of differences that emerged in a recent online survey conducted by Resonate, one of the many companies that collect large swaths of data about our online browsing habits, shopping preferences and voting records; analyze that information; and sell their findings to political campaigns and companies. Resonate recently provided data to NPR showing how people who prefer Clinton, Sanders and Biden differ when it comes to political views and personal habits. This type of information — what sort of voters are likely to be found shopping or consuming media where — is critical for campaigns. They use it to identify, recruit and advertise to voters. In fact, former Florida Gov. Jeb Bush's campaign recently touted its "database of approximately 260 million individuals with about 2,000 data points" in a memo designed to deflect criticism that Bush's White House bid is struggling. "If all you want is to find people who are already Democrats, that's fine," said Horn. "But if you want to try to find swing voters — people who either don't belong to a party, or don't reliably vote for one party or another, you need some other way of understanding who is likely to be a swing voter." Voters' and consumers' personal data have always been valuable to companies and political campaigns. As far back as the mid-20th century, campaigns collected personal information, such as magazine subscriptions, in an attempt to refine their messages. But in recent years, as more and more of our lives have migrated online, it's become much more accessible, and also much easier to package, analyze and sell. Like other companies, Resonate observes people's online habits by putting lines of code called cookies on websites. When you visit a site, the cookie gets attached to your browser. It then keeps tabs on the sites you go to and reports that information back to the company doing the tracking. The company then goes one step further and recruits people it has observed to take part in massive online surveys, which ask about political beliefs, policy preferences, and brand habits. About 9,300 people took part in the survey quoted in this story. The information is made anonymous by the time it's passed along to campaigns and other clients — it's more about the habits and viewpoints of large chunks of people like you, not which websites you personally are browsing. Resonate provided NPR with about 80 questions where the differences among Clinton, Biden and Sanders supporters were most acute. Far more Sanders supporters — nearly 7 in 10 — are inclined to oppose the controversial Keystone XL pipeline than are Clinton or Biden backers. One trend Biden advisers may want to take note of as the vice president contemplates a presidential campaign: On issue after issue, Biden supporters tend to be much more conservative — at least in the context of a Democratic primary — than respondents who back Clinton or Sanders. Take energy: In addition to being less inclined to oppose the Keystone pipeline, Biden backers support coal-heavy energy policies, as well as the use of hydraulic fracturing — or fracking — to extract oil and natural gas at much higher rates than Clinton or Sanders supporters. Support for fracking isn't exactly rampant among Biden supporters — just 17 percent told Resonate they back the policy — but that's still a much higher figure than the 12 percent of Clinton supporters or 4 percent of Sanders backers who told the survey they support fracking. In fact, while just 2 percent of Sanders supporters define themselves as "conservative" in the survey, almost 20 percent of Biden backers see themselves that way. "Blue Dog Democrats — I think that's where you see a lot of support [for Biden] coming in," said Horn. "The industrial Democratic belt. These are people who are Democrats because they're pro-union, but otherwise could be social conservatives, could be fiscal conservatives. They're single-issue voters sometimes, and that issue is labor politics." If Resonate's data ring true, a potential Biden campaign would have to come at Clinton from the right.